Last year, MDC eliminated more than 9300 feral hogs in the state. The goal is to completely eradicate them in Missouri. "Feral hogs are an extremely destructive species. 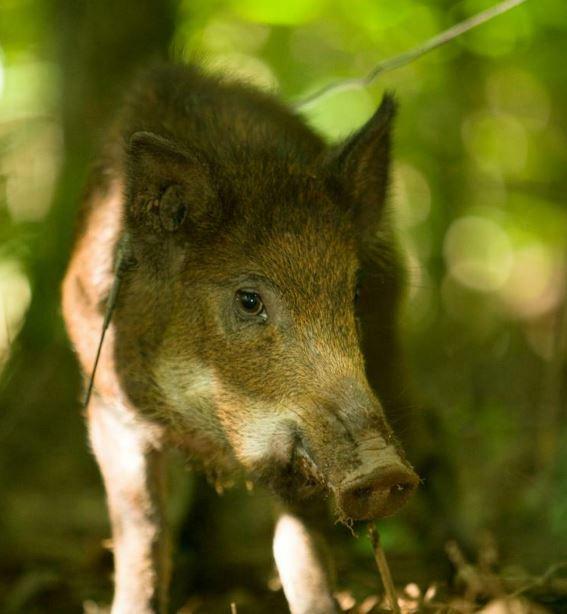 They use their nose to root the ground and search for food, destroying crops, hay fields, pasture land, anything--yards, gardens, flower beds--anything that they can get into they'll destroy," said Mark McLain, MDC’s feral hog elimination team coordinator. He said the habits of feral hogs can lead to soil erosion and sediment in streams. When they root, the soil is upturned, and that causes vegetation on the ground, which native species depend on, to be replaced by weeds, which aren’t as nutritious. 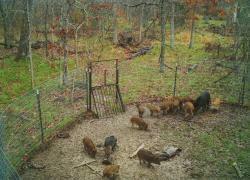 According to MDC, one social group of ten hogs can destroy 20 to 30 acres overnight. And McLain said they’re prolific breeders. One female, on average, will produce two litters each year with around six piglets in each. And they start reproducing as young as six months. "So you get a lot of those feral hogs on the landscape in a very short period of time, and that outcompetes the native wildlife for the resources we have here: The food, water and shelter," he said. Another reason the animals are a problem: McLain says one feral hog can carry as many as 30 different diseases that can be spread to pets, livestock, native animals and humans. That concerns veterinarian Dr. Alan Wessler, a member of the Missouri Farmers Care Board. "When you start talking about diseases, such as pseudorabies, brucellosis, leptosporosis, EColi, salmonella, tuberculosis and others, it causes you to jerk your head up and look around and say, 'this is a problem that needs addressing,'" he said. Missouri Farmers Care, made up of about 45 organizations involved in agriculture in Missouri, has gone on record as supporting the Missouri Department of Conservation’s efforts to eliminate feral hogs because of the impact it could have on the state’s agricultural industry, he said. "I think it's important to remember that agriculture is the state's number one economic engine, and animal agriculture is about half, a little less, of that amount. That's a huge amount--about an $84 billion industry, so we're talking about a significant economic engine here that that problem is working on," said Wessler. Feral hogs have been running loose on Missouri’s landscape since the days of open range, according to MDC. But in the 1990s, hog hunting became more popular. Groups began raising European wild boar for hunting on captive facilities and for alternative agriculture. But some escaped. Others were released by what McLain called “misguided individuals” on public land for hunting. Hunting of feral hogs was allowed on public lands for more than 20 years, he said, but it became clear that that method wasn’t going to be effective in getting rid of them and, in fact, was making the problem worse. Feral hogs that were once found in just a few counties are now found in more than 30, many in southeast Missouri. MDC prohibited hunting of feral hogs in 2016 on lands it owns, leases or manages. The goal, McLain said, was to try to stop the illegal release of the animals for hunting. "Hunting is not a way to eliminate any species. Hunting is a tool to manage the population, and we don't want to manage these destructive pests. We want to eliminate them from the state," he said. Hunting scatters a group of feral hogs, known as a sounder, and hunting dogs might chase some of the animals for miles. So MDC works to eliminate them by trapping the whole sounder at the same time. "With consistent effort and with the techniques that we use to get them all into the trap at one time before the trap is triggered and then remove that whole group and then we can move on to the next group," McLain said. 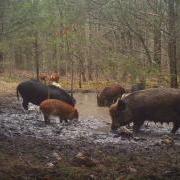 MDC employees start by baiting, and when a group of hogs gets used to coming to that spot, the animals are eventually trapped. "Once they're coming in comfortably and all the hogs are coming in at the same time comfortably, then we'll set the trigger and drop the trap on the whole group and eliminate them," McLain said. While there are some areas where small populations of feral hogs have been completely eliminated, McLain says eradication of feral hogs from Missouri is going to take some time. There are still people releasing them for hunting, something he knows because of signs that trapped feral hogs have been touched by humans, like ears that have been cropped. But McLain is hopeful. "We're very optimistic that, with some time, that we will eliminate all the hogs from Missouri," he said. According to McLain, if you have a feral hog problem on your land, call your local MDC office or go to mdc.mo.gov/feralhogs to report it.